Saorview approved retailers, Saorview installers - Greenan Electrical Boyle Co Roscommon. 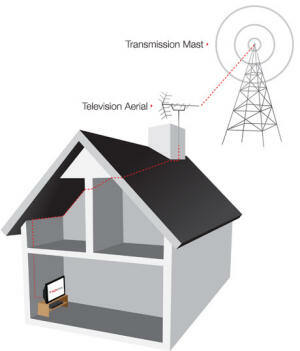 SAORVIEW is a digital terrestrial television (DTT) service which means the signal is broadcast from transmission masts across the country and is received through a standard TV aerial paired with either a set-top-box or a new integrated digital television (iDTV). Digital television has been available as a satellite subscription service across the country and as a cable subscription services in certain parts of the country for a number of years. These services are what are often described as ‘Pay TV’ services which typically require an initial set up cost and monthly payment. SAORVIEW is Ireland’s first free (free-to-air) national digital television service. This means that for most people after an initial purchase of either a set-top-box receiver or a new integrated digital television (iDTV) with a built in receiver, there are no further costs associated with the service – no contracts and no monthly bills. Viewers used to receiving analogue television through an aerial will notice crystal clear pictures and great sound quality on SAORVIEW. In addition, SAORVIEW will offer High Definition (HD) pictures and sound. HD television provides exceptionally clear, sharp pictures with vivid colours and up to five times more detail than standard definition. Certain types of television programmes particularly benefit from HD, in particular sports, wildlife, drama and film. More and more television programmes are now being made in HD and most new flat-screen televisions are now HD Ready. The launch of free-to-air HD services on SAORVIEW will likely lead to more and more Irish programming being made in HD in the next few years. Analogue Switch Off (ASO) is when analogue television transmission in Ireland will be turned off. This will happen in late 2012. Like the rest of Europe, North America and many other countries, television broadcasting in Ireland is switching from analogue to digital transmission. Digital television is a major step change in broadcasting that has many advantages over analogue for TV viewers. Digital TV can offer more channels, high definition (HD) pictures and sound, on-screen programme guides and new interactive services. From a national economic perspective, digital transmission allows for far more efficient use of valuable radio spectrum. Moving to digital will free up radio spectrum for use by other important communications services such as broadband, mobile TV or other communications services. The Government has estimated that the Irish economy will benefit by up to €500 million over the next decade as a result of the switch to digital television. The EU has mandated the end of 2012 as the final date for ASO in Europe, by which time Ireland needs to have launched a replacement digital transmission system to ensure all Irish audiences can continue to access free-to-air television. SAORVIEW is the digital free-to-air television service that will replace the analogue system which has been in operation since 1962. SAORVIEW plans to offer the best Irish television – free for everyone. During 2010 the channels planned for SAORVIEW broadcast the 100 most watched TV programmes in Ireland. This means that regardless of the wide range of choice that is now available in many homes, Irish people still love Irish television. Whether it be unique Irish TV events such as the Rose of Tralee or the Late Late Toy Show, home produced favourites such as the Dragon’s Den, The Apprentice, Fair City or Reeling in the Years, the best acquired series such as Desperate Housewives, Mad Men or Grey’s Anatomy, Irish and UK entertainment shows like the All Ireland Talent Show and the X Factor, quality Irish news reporting and current affairs programming, blockbuster movies or the full range of Irish and international sport – Irish audiences continue to tune in everyday to Irish channels in their hundreds of thousands. All of these programmes and much more will be available for free in sparkling digital quality on SAORVIEW. For most households currently receiving analogue television through a rooftop aerial the costs of switching will simply be the cost of a set-top-box or a new iDTV. Assuming your aerial is fine and you simply want to upgrade your existing television, your total cost will be for a standard SAORVIEW approved set-top-box that you install yourself. Some households will need a new TV aerial or need to adjust their existing aerial to receive SAORVIEW. The prices for this will vary depending on your home and the total amount of work required. We at Greenan Electrical are Saorview Approved Retailers and also have own professional installation team. Coverage shown is based on a rooftop aerial in good condition (indoor reception may be possible in areas with very good signal strength). Coverage shown is indicative only. Local environment (hills, forestry, trees, buildings, and other large obstructions) will cause coverage to vary.